The ASTEC® PLUS Tire Evaluation Center measures tire uniformity for passenger and light truck radial tires. The purpose of the ASTEC® PLUS Tire Evaluation Center is to assure tire quality. This is done by measuring, grading, marking, and sorting tires according to force variation, runout, and sidewall appearance. 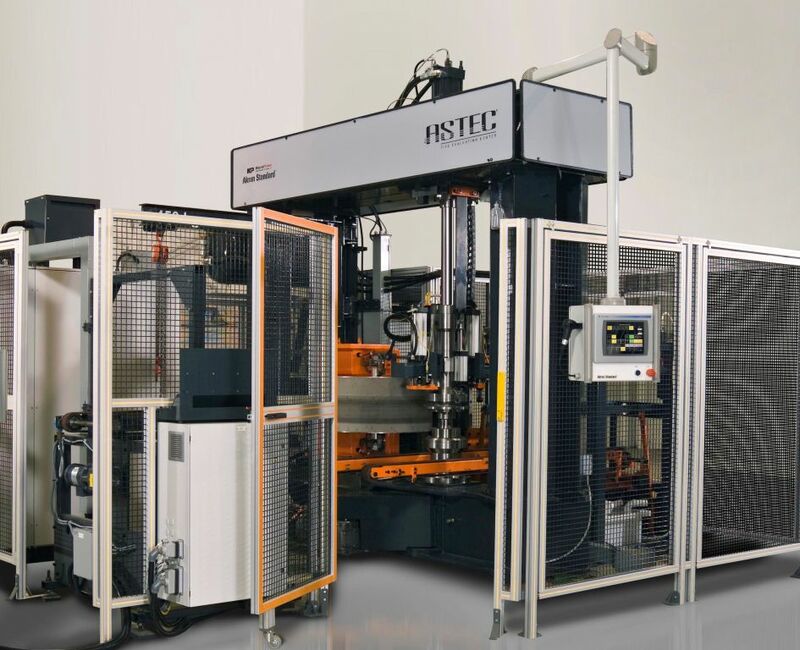 ASTEC® PLUS is used for 100% tire uniformity checking in production. It can automatically adjust to different tire widths and test conditions for different tires within each bead diameter. Force Variation is a tire behaviour that creates ride disturbances such as vehicle vibration. Radial force variation induces forces into the vehicle on every tire rotation. These forces are amplified by the vehicle’s suspension when the forces occur at the vehicle’s natural frequency. Lateral force variation also creates vibration and steering pull. Runout is a measure of the “out-of-roundness” of a tire. Radial and lateral runouts also cause ride disturbances during each tire rotation. Sidewall Appearance is the visual quality of a tire, which is influenced by several tire construction features, such as sidewall splice, body ply spice, and component quality. When splices are overlapped they can create a depression in the sidewall when the tire is inflated. When splices aren’t placed together correctly they can cause a bulge. These defects are not acceptable to the consumer. Tire and automobile manufacturers set limits on the acceptable values of force variation, runout, and sidewall appearance to assure good ride quality and customer satisfaction. ASTEC® PLUS provides for the measurement, grading, marking, and sorting of tires to meet these requirements. In addition, ASTEC® PLUS can rework with the assistance of center and shoulder grinders tires to reduce radial force variation and runout, resulting in fewer scrapped or downgraded tires. ASTEC® PLUS has the best measurement repeatability of any machine in the industry. This means that there is very little measurement error. When more tires pass grade limits factory yields increase. The ASTEC® PLUS is designed maximum access to the machines main components while also keeping the operator and bystander’s safe. The exit drop conveyor drops down for easy access to the testing stations as well as the markers. Protective guarding with access doors around the machine, open when the machine has been safely stopped. This allows easy access to the entire machine.